Ah, love! I love love. I love being in love and writing about love, and I own a chick flick library! 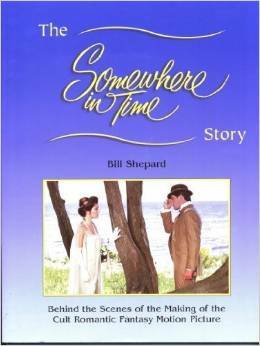 The ultimate Somewhere in Time collectible. . . Imagine owning a key prop from "The Most Romantic Love Story Ever Filmed." So like the one in the "Hall of History." This portrait was designed so that wherever you are in the room, Elise is gazing at you. Antique finish gold wood frame measures 14" x 16" inches, the image itself 8" x 10", under glass, ready to hang. Image is printed on museum archival paper, using fade resistant inks (superior to a photograph), the sort of treatment this precious memento deserves. Handmade of wood, this gorgeous piece measures 6" x 20" x 5", and is a replica of the Grand Hotel music box prop used in the film. When the lid is opened, it plays the famous Rachmaninoff theme. The Somewhere in Time Gallery is proud to offer this Somewhere in Time Limited Edition Pocket Watch. Limited to only 1000 pieces, this beautiful collectible will be treasured by devoted fans the world over. Own this piece of movie history, which is also a practical timekeeper and a beautiful piece of jewelry, heralding this beloved film. The perfect Somewhere In Time gift for both ladies and gentlemen - this symbolic pocket watch embodies Time Travel, Romance and the Eternal Love of Richard and Elise.